Set on an island off the coast of New England in the summer of 1965, MOONRISE KINGDOM tells the story of two 12-year-olds who fall in love, make a secret pact, and run away together into the wilderness. As various authorities try to hunt them down, a violent storm is brewing off-shore -- and the peaceful island community is turned upside down in more ways than anyone can handle. Download Moonrise Kingdom in Digital HD from the iTunes store. Moonrise Kingdom images are © Focus Features. All Rights Reserved. Ever wish to go back to the fantasy childhood you never had? In Wes Anderson's newest film released to Blu-ray "Moonrise Kingdom" you get to travel back in time to 1965 to the island of New Penzance, where you get to follow the childhood adventures of Sam, a troubled young man who has been unsuccessfully trying to fit in as a Khaki Scout. While attending a play at the local church, Sam wanders into the girls dressing room and immediately falls for the wounded raven, Suzy. The two misfits become pen pals and through their correspondence decide to run away together. At the same time, while inspecting his scouts, Scout Master Ward (played by Edward Norton) realizes he is missing a scout. Now most of the scouts don't seem worried, in fact they didn't really care for him much anyway, but Scout Master Ward has to rally the troops and find their missing man. Scout Master Ward contacts the local Sherriff, Captain Sharp (played by Bruce Willis) to let him know of the situation. Together they call the parents only to find he's not invited to come back home. Quite a surprise to Scout Master Ward who had no idea Sam was an orphan. While all this is going on, Suzy's parents Laura and Walt Bishop (played by Frances McDormand & Bill Murray) realize that she is missing. The Bishops, both argumentative lawyers who have their own marriage issues, set out to find their daughter. Now mind the fact that this is the 1960's. No cell phones or tracking devices, no technology that we are accustomed to today exists. 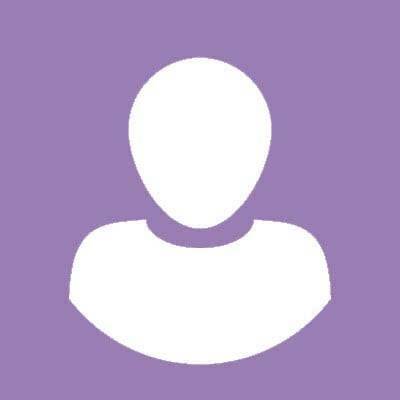 So while New Penzance is a very small island, and most everyone on the island knows each other, its not as easy to find a missing person as it would be today. Let alone find a prepared Khaki Scout who's in love! 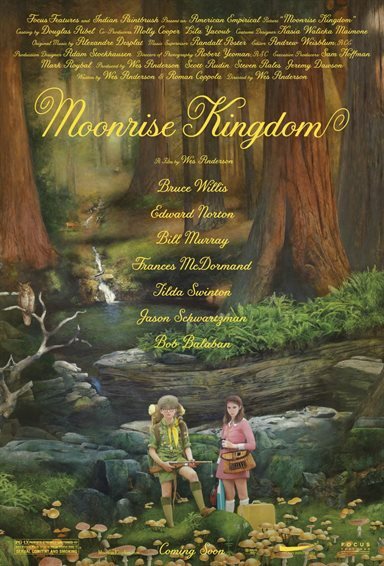 Moonrise Kingdom's true stars were Kara Hayward who plays Suzy and Jared Gilman who plays Sam. In their first feature length film, they both carry the story like pros and their acting is never overshadowed by their star-studded counterparts. Filling out the cast is Jason Schwartzman ("The Darjeeling Limited" & "Rushmore") who plays a pivotal role in Sam and Suzy's life; Bob Balaban ("Close Encounters of the Third Kind" & "Gosford Park") who plays the Narrator, Harvey Keitel ("Resevoir Dogs") who plays Commander Pierce the head of the Khaki Scouts and even Tilda Swinton jumps into the mix as the social services agent in charge of retrieving Sam. Wes Anderson, who is best known for "Rushmore", "The Royal Tenebaums" and most recently "Fantastic Mr. Fox", creates a wonderful fun filled adventure on his own fantasy island of misfit characters, set back in a time period you can't help not to love. Each scene is beautifully created, costumed and each set is like a work of art It's almost as if each scene is set up to be a promotional postcard for the island of New Penzance. At the heart of "Moonrise Kingdom" lies a quirky childhood love story that triumphs over all those who would rather see it falter. It's a pretty simple story, yet Anderson tells it like a beautifully created fairytale, not of our time. 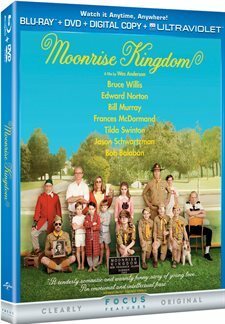 Extras included with in the Blu-ray edition include a behind the scenes tour of the set by Bill Murray and a making of feature "A Look Inside Moonrise Kingdom" along with some other little promotional pieces. Not much that really gives you more insight into how they made the film. But if you're a Wes Anderson fan you'll get the quirkiness of each of the additions. "Moonrise Kingdom" is whimsical, witty and fun! I give it 4 Khaki Scout badges out of 5! just don't forget your record player! 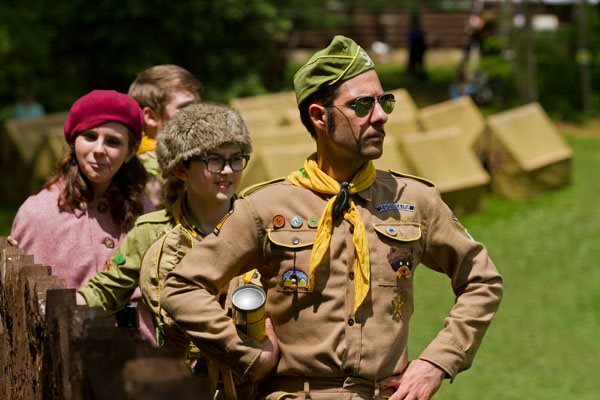 Moonrise Kingdom images © Focus Features. All Rights Reserved.